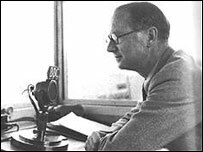 In the immediate post-war years, Rex Alston and Raymond Glendenning were the two prominent voices of sport on the radio. Between them they covered almost every sporting outside broadcast. Rex's subjects were rugby, at which he had captained Bedford, athletics, for which he had won a blue at Cambridge, cricket at which he had captained Bedfordshire, and tennis, about which he freely admitted he knew very little. These were the days of the all-rounder. A schoolmaster at Bedford School, Rex had joined the BBC during the war as a billeting officer, but an enlightened corporation soon realised that the voice was too good for an administrative role. During the Victory Tests of 1945, he trailed Howard Marshall to see how it should be done and was thrust into the hot seat at Old Trafford, when Marshall was summoned to London for a meeting. As cricket commentaries gathered momentum in the following years, he was not only an ever-present in a commentary team which included John Arlott and E W Swanton, but the producer as well. When the first Test of the 1948 Ashes series was delayed by rain he found himself on the air, waffling and wondering what to do. He was not disappointed to hear a voice in his headphones call out desperately, "For God's sake hand back to the studio!" That said, his delivery was exquisite. His voice was light and, even into his 90ss, quite youthful, with a slightly schoolmasterly style. In 1950, when the West Indies clinched their first victory at Lord's, Rex was on at the end to describe scenes of jubilation. "One or two West Indian characters coming out on the field, waving their hats . . . Goddard running in . . . being chased harem scarem by lots of West Indian supporters. "Such a sight never been seen before at Lord's." Alston was on the receiving end of quite a few Brian Johnston leg-pulls, the most celebrated being accidental. "Now over to Edgbaston for some more balls from Rex Alston," Johnstone said, forever after referring to his colleague as "Balston". Rex retired from the BBC staff in 1961 and took little part in Test Match Special after that, though he did cover county cricket and rugby for some time for both the BBC and the Daily Telegraph. John Arlott - the "voice of summer"